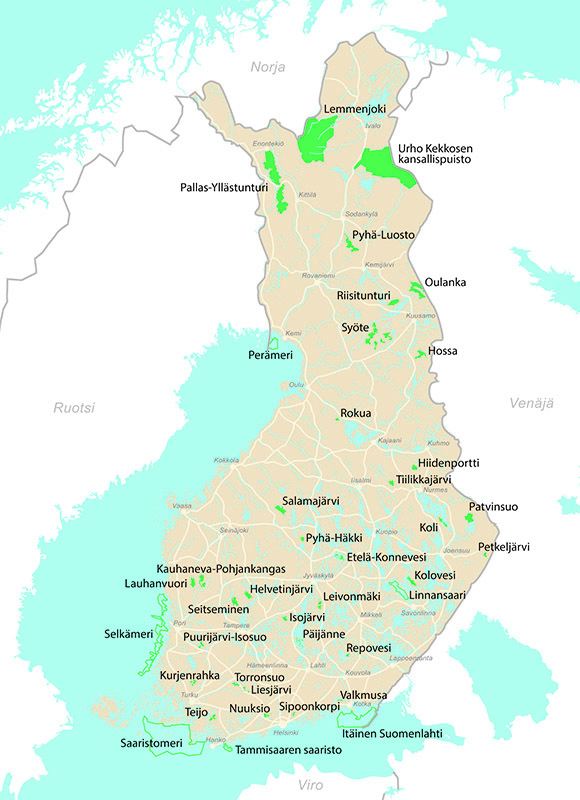 There are 40 national parks in Finland covering total of 10 002 km2. Here is a multimedia presentation of my seven year-long project of all the national parks of Finland. The last technical part was done together with a multimedia “guru” Kari Kuukka (docimages.org). The 12 minute-long presentation is diveded into four separate parts: forests and wetlands, lakes and rivers, archipelago and fells. MULTIMEDIA: National parks of Finland – 4 parts – total of 12 minutes. – ENJOY! FIN: Yllä 12 minuutin multimediaesitys seitsemän vuotta kestäneestä projektistani Suomen kansallispuistoista. Viimeisen teknisen osuuden toteutin yhdessä “multimediagurun” Kari Kuukan kanssa (docimages.org). Esitys on jaettu neljään osaan: metsät ja suot, järvet ja joet, saaristo ja tunturit. 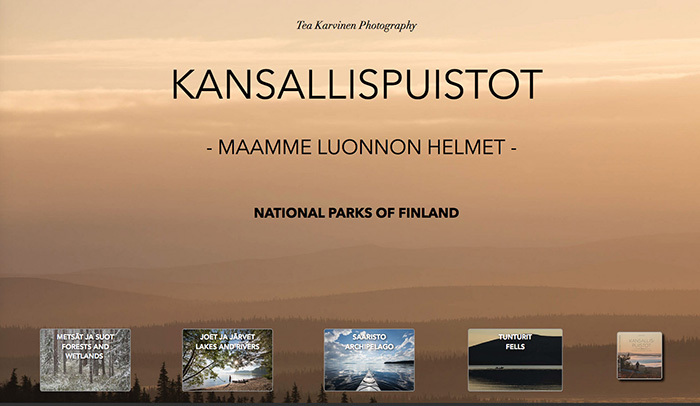 My national park project “Kansallispuistot – maamme luonnon helmet” is one of the official programs when celebrating Finland’s 100 years of age in 2017. My project includes 4 topics: a book, a photo exhibition tour, school tours and nature/national park topic lectures with picture presentations. My BOOK of the national parks of Finland (in Finnish language as well as in English = two books) came out end of August 2017. In two weeks it sold out. Three month after publishing we got the 3rd edition at the same time as we placed the order of the 4th edition. MORE INFO ABOUT THE BOOK + the book order here. Check out some book pages, a brochure and published articles here. If you want to see more images (than there are on this website) of our beautiful national parks, please, visit my ARCHIVE WEBSITE. 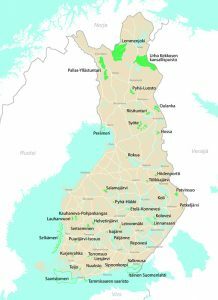 Since 2011 Finland has got 5 new national parks. The newest one, Hossa, was established in June 2017 as the 40th national park of Finland in honor of the 100 years of age of Finland. Sipoonkorpi in the capital area and Selkämeri (Bothnian Sea) on the Southwest coast of Finland were established in 2011. Etelä-Konnevesi, in the central Finland, became a national park in 2014 and Teijo, in the very south, was established in January 2015.